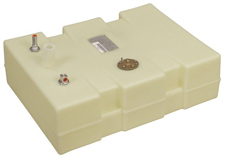 Permanent below deck plastic fuel tank. 18-1/2"W x 24-1/2"L x 7-1/4"H.
Seamless construction, leak-proof and corrosion resistant. Tank is complete with fill adapters, vents and fuel sender.